The tiny homes trend has showed no sign of slowing down in 2019. As countries around the world search for a solution to expensive mortgages and rising rents, many residents have taken to downsizing their square footage. A new model from the international tiny homes architect Pin-Up House was designed with this very issue in mind. At 69 square feet, the “Magenta” tiny home can be built for $10,000, with materials costing around $2,100 and labor costing around $7,900.There’s just one catch: the Magenta is only available as a DIY project. Pin-Up House sells the design plans for $129, and residents are expected to take care of the rest. For those willing to tackle the construction themselves, the home is a steal. Take a look at the finished product. The Magenta may get its name from the stark shade of its exterior, but its DIY design allows residents to choose their color. Though the inside is incredibly small, the home’s architects have managed to fit a table, chairs, and pull-out sofa. 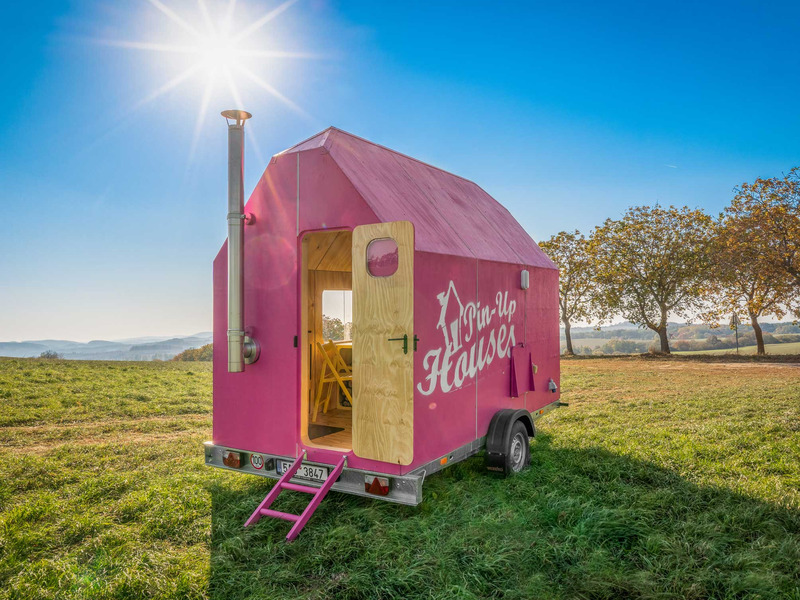 The Magenta is built on a flat trailer, which makes it portable. While Pin-Up Houses designs homes for couples and small families, this one seems best suited for an individual. The walls are made of heat-insulated, waterproof plywood. The ceilings and walls are draped in netting, which offers makeshift storage. There are also storage bins tucked beneath the pull-out sofa. Construction on the Magenta should last three months — the industry average for tiny homes. The bathroom and kitchenette are folded into the back wall. The kitchenette has just enough room for a stove, sink, and storage space. The bathroom has a toilet, but no shower. While the design may seem unorthodox, it’s actually quite common for tiny homes to come without a shower. When it comes time to rinse, many owners are comfortable showering at their local gym. At $10,000, the Magenta is among the cheapest tiny homes on the market.